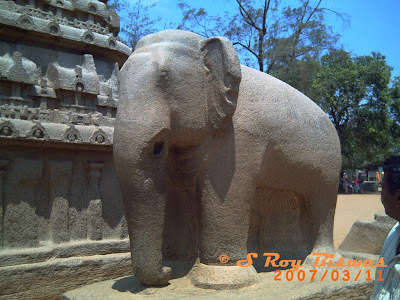 I had visited the destination in 2007, but had just put in a cryptic little blog for Sulekha, as they were the starting days for me of posting blogs. However, I have not shifted the blog to this site and accordingly, have penned a fresh travel blog. The occasion was the annual convocation being organized by the office was working for at that particular point of time and we had to visit the destination to tie up the ends and finally had to open a camp office in Chennai for a week at the time of the Convocation in February, 2007. After conclusion of the Convocation and having wound up the work, I availed a days leave to explore Mahabalipuram also. 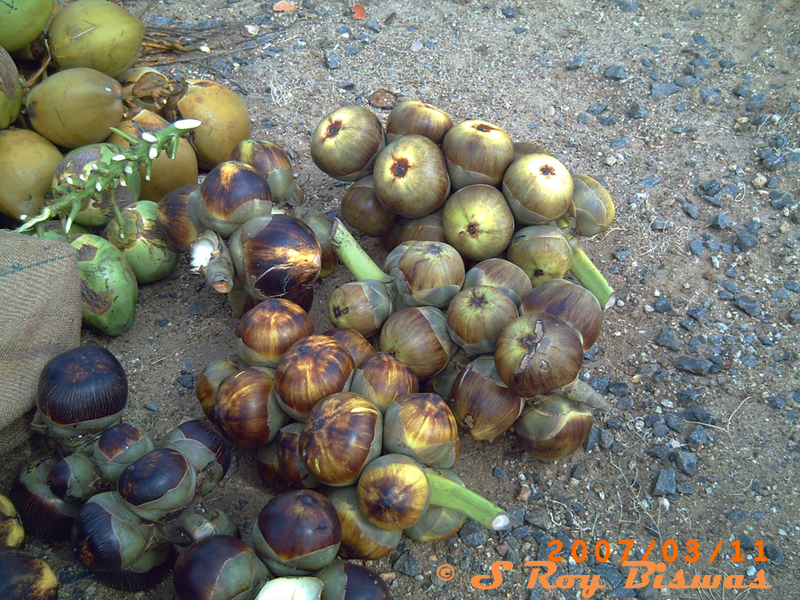 Chennai is an unusually hot place and even in month of February, we were able to get ripe Palm fruits being sold by the road side when we went visiting Mahabalipuram. Madras was one of the first outposts of British East India Company founded in 1639, when the British East India Company (represented by Francis Day and Andrew Cogan and aided by a local translator Beri Thimappa) was granted land to build a trading settlement by the local Telugu ruler (Nayak) of the suburb of Vandavasi, Damerla Venkatapathy Naidu on his father's name Damerla Chennappa Naidu. The document of the land grant is dated 22 August 1639, and hence Madras celebrates its birthday on 22 August each year as Madras day. Madras is derived from Madraspatnam, a name given to the area when the British negotiated settling there with Damerla Venkatapathy Nayakudu. The British built Fort St. George (today the legislative and administrative seat of the state). Fort St George was completed on St George's day in 1640 (23 April) and hence was named after the patron saint. George Town then developed becoming the modern city of Madras, absorbing several nearby boroughs. Thomas, one of the twelve apostles of Jesus Christ, is associated with Chennai. In 1996, the Tamilnadu government renamed Madras to Chennai providing the reason that 'Chennai' was the city's traditional name while Madras was one derived during colonial rule. Being situated on the coastline of India on the Indian Ocean side, there are quite a few beaches around Chennai, the most famous amongst these beaches are – i) Marina Beach, which is a 12 km long and offers excellent opportunities for walks and has a very wide sandy foreshore. Its width is up to 300 m (985 ft). The Marina of Madras is the second longest urban beach in the world. The South Beach Road runs past the Madras University, the Senate House, the Chepauk Palace; ii) Edward Elliot's beach, is spread along the coast down south from Marina. This beach is comparatively quieter and it is located near Besant Nagar. 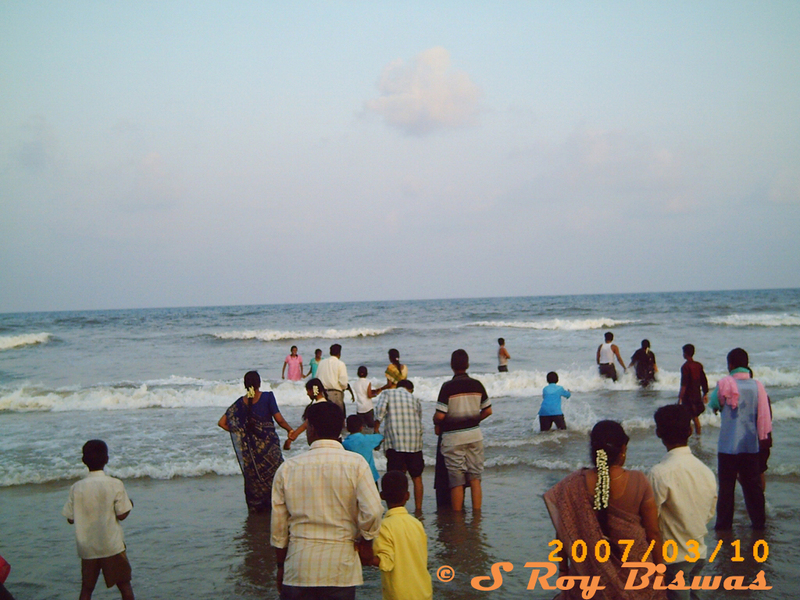 At the end of this beach are the Velankanni church and the Ashtalakshmi temple; iii) Breezy Beach is located in the quiet neighborhood of Valmiki Nagar (Thiruvanmiyur) in Chennai. 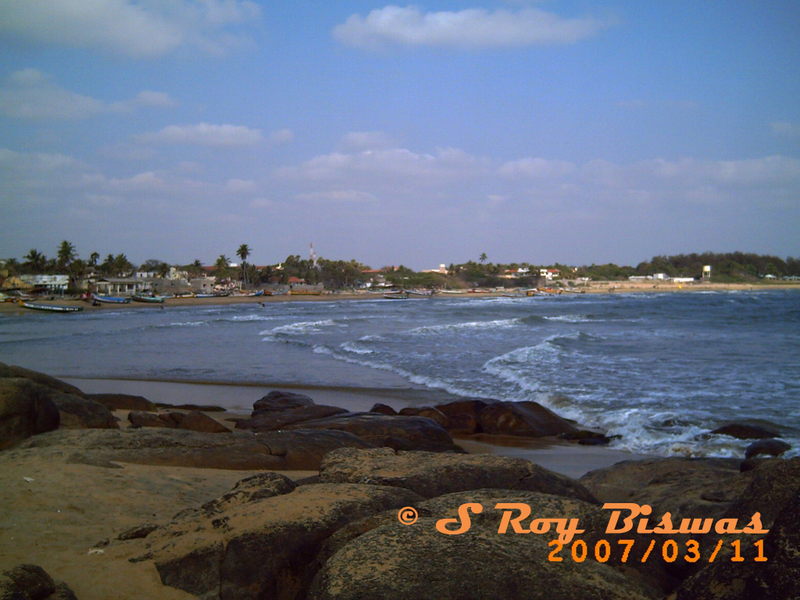 It is smaller and less popular than the Elliot's beach; and iv) Covelong as it was known earlier is a small fishing village located 40 km (25 mi) from Chennai on the way to Mahabalipuram. Now it is a luxury beach resort. There was a fort built by the Nawab of Carnatic, Saadat Ali. It was here that the French General Labourdonnais landed his troops in 1746. Later it was taken by Robert Clive in 1752 and destroyed. 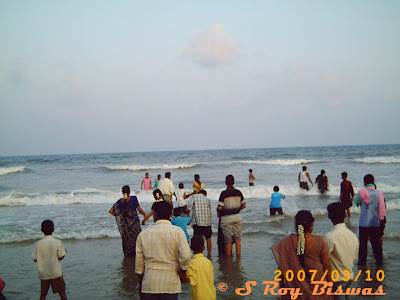 The Beach is separated from the mainland by the canal running from Chennai to Mahabalipuram. I had the opportunity to visit the first named and last named beaches due to paucity of time. 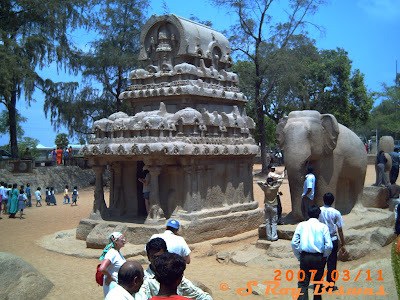 Mahabalipuram is situated 60 Kms. south of Chennai and easily accessible by road throughout the year. Chennai in turn is accessible both by Air & Rail/Road from across India. The best advised visit window is between December to February, as one has to trek a vast stretchs on foot to explore the entire Temple complex. 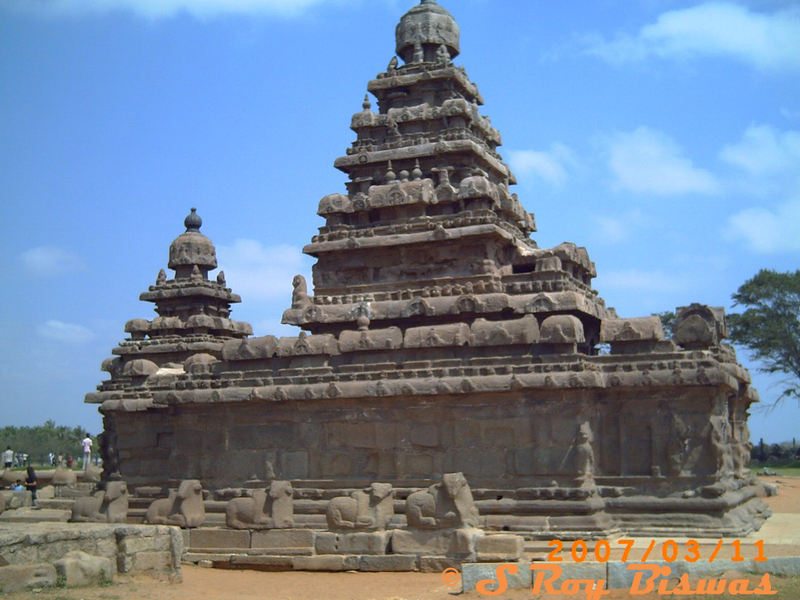 Mahabalipuram is a 7th century port city named after Pallava king Mamalla. It was built between the 7th & 9th Centrury AD and comprise of various temple complexes built in Dravidian style of architecture and reflect distictive influence of Buddhist elements of rock cut sculptures & design - It has been declared as a UNESCO Heritage site. 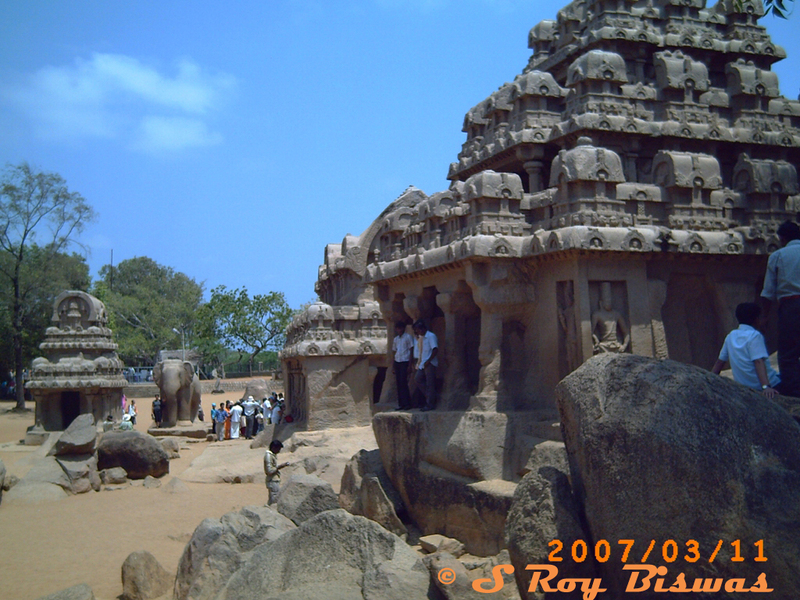 The temples comprise of three main categories - Cave Temple, Rathas (sculpted out of monolithic natural stone formations) and sculpted relief’s on rock faces. The ancient Mamallapuram, as Mahabalipuram was formerly known, was flourishing port town of the Pallava rulers of south India who chiseled in stone a fabulous "open-air museum" of sculpture under the vault of a burning sky. 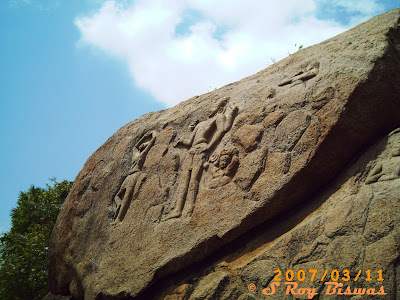 Most of the temples and rock carvings of this place were built during the reigns of Narsinha Varman I (AD 630-668) and Narsinha Varman II (AD 700-728). Though the initial kings of Pallava dynasty were followers of Jainism, the conversion of Mahendra Varman (AD 600-630) to Shaivism led most of the monuments to be related with Shiva or Vishnu. 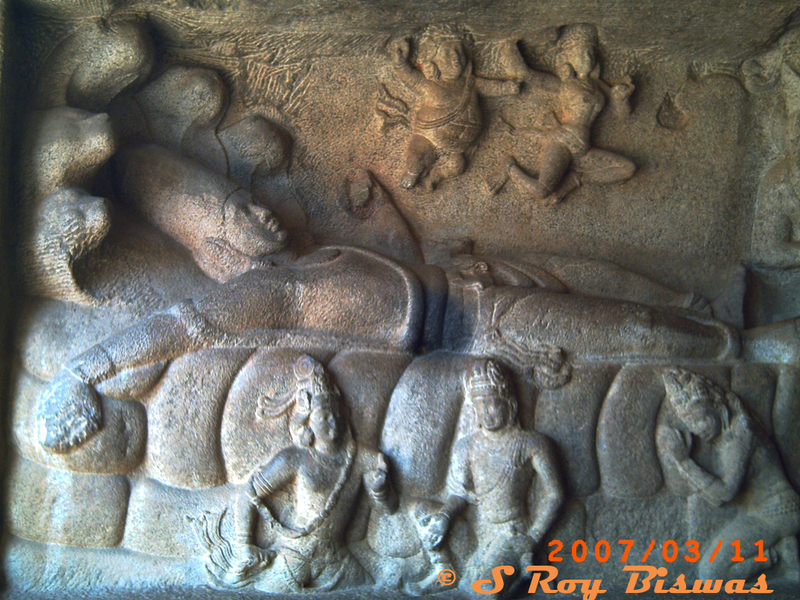 The Five Rathas - The five Rathas were fashioned like the wooden chariots drawn during those times and include the Dharmaraja, the Bhima, the Arjuna, the Draupadi and the Sahadeva. The Five Rathas, about 200 m south of the main hill, were fashioned out of a smaller hill sloping down from the south. From the largest part was made the biggest of the five rathas, the Dharmaraja. Then followed onwards north, in the descending order of height, the Bhima, the Arjuna and the Draupadi. 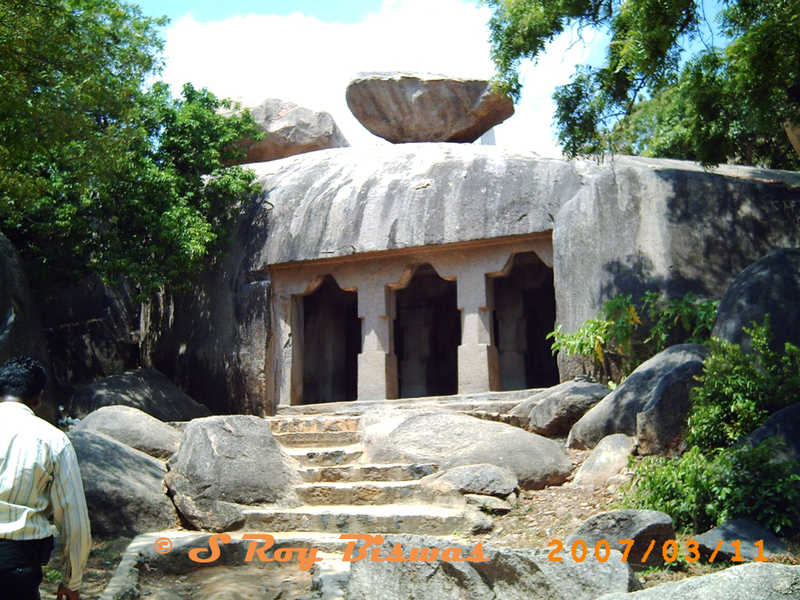 A little to the west of Draupadi there was a comparatively large rock and out of it the Sahadeva Ratha was made. Immediately in front of the Draupadi again two smaller rocks were sculptured into an elephant and a lion. 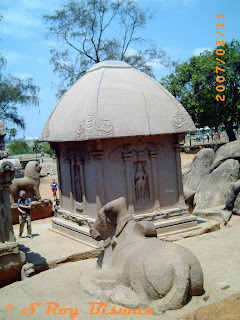 Behind the Draupadi and the Arjuna, which stand on a common base, there is a Nandi. 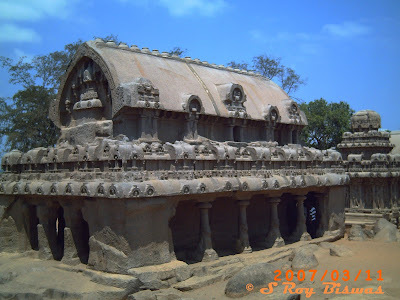 Mandapas - The main hill at Mamallapuram is dotted with pillared halls carved into the rock face. These mandapas, with their graceful columns and intricate figure sculptures bear witness to the artistry of the Pallavan rock cutter. 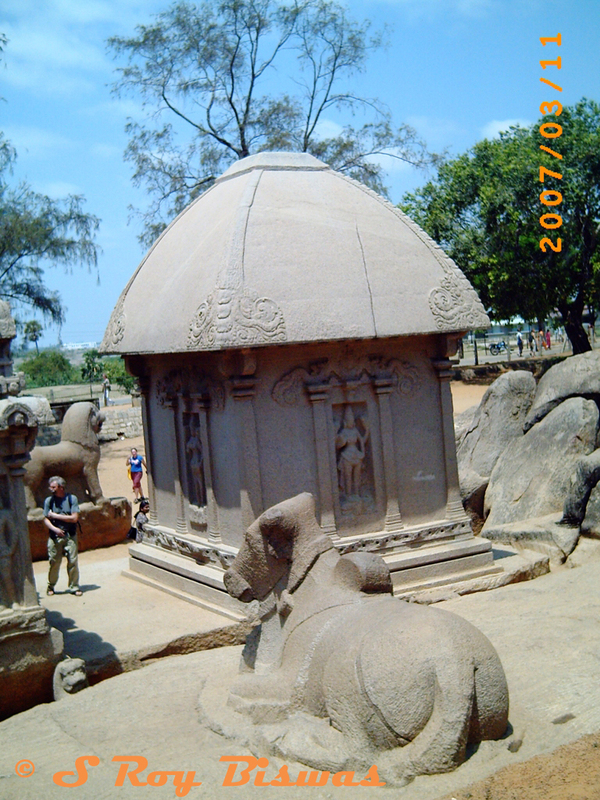 The ten pavilions at Mamallapuram, of which two are unfinished, were designed as shrine, with a sanctum and on outer hall. The shallow porticoes are adorned with exquisite sculptures of gods, goddesses and mythological figures. 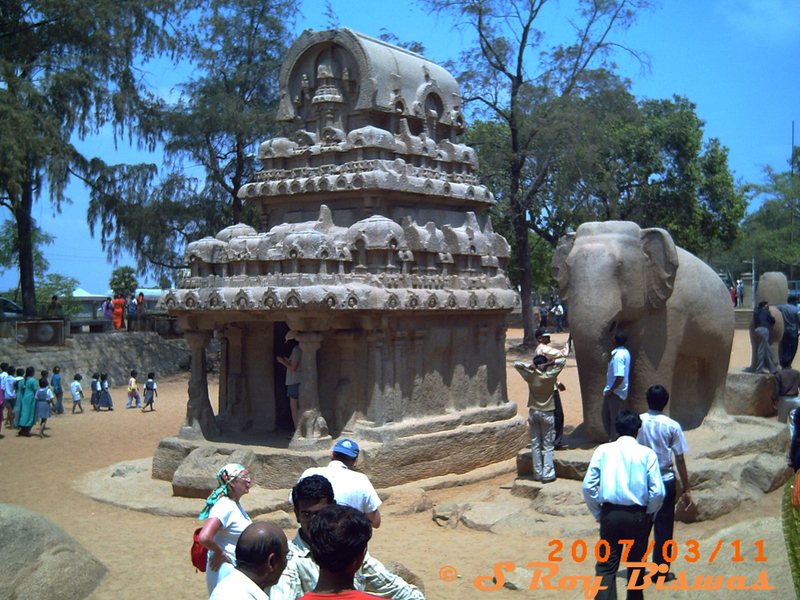 The Ganesh mandapa is an active shrine even today, with the idol of the elephant-god being revered by the faithful, fourteen centuries after it was first consecrated. Beyond the circular rock called Krishna's Butterball is the Varaha mandapa dedicated to the two avatars of Vishnu as Varaha the boar and Vamana the dwarf. The pillars of this pavilion are perhaps the earliest to display a motif that became the signature of southern architecture-the lion pilaster, where a heraldic lion support ornamental pillar. 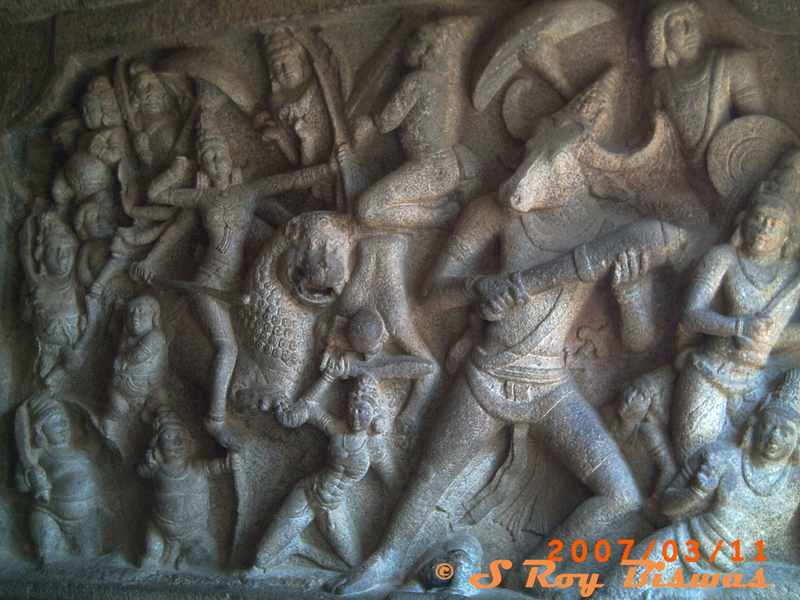 The Mahishasura mardini mandapa has the goddess Durga in bas relief, slaying a buffalo-headed demon, and the Vishnu Sayana Mandapa shows Lord Vishnu lying under the protective hood of the seven-headed serpent Adishesha. Of the other mandapas, the Panch Pandava mandapa, that is unfinished, has a more elaborate facade. Its pillars are adorned with rearing lions springing from the capital, and the shrine is the only one surrounded by a passage which allows passage around it's circumference. 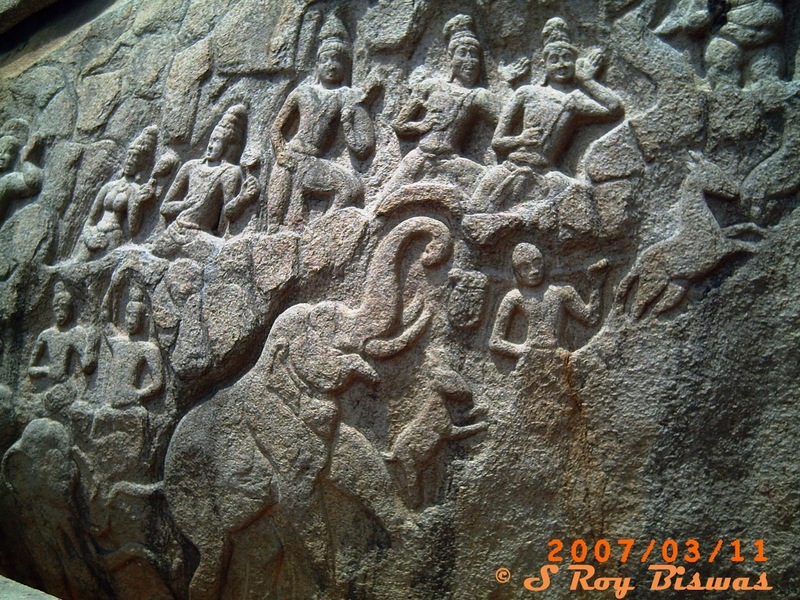 Arjuna's Penance - This skillfully carved rock is the largest bas - relief sculpture in the world. It gets its name from the figure of an ascetic who is believed to be Arjuna, the hero of Mahabharata, doing penance to obtain a boon from Lord Siva. However, there are others who think that the figure is actually Bhagiratha who entreated Siva to let the river Ganges flow over the earth. 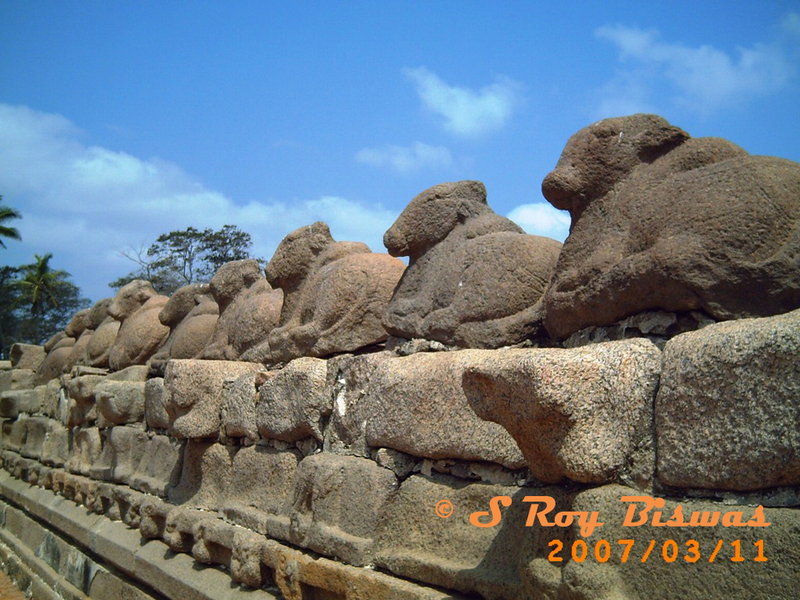 Shore Temple - Facing the sea and designed to catch the first rays of the rising golden sun, the Shore temple is perched on top of a rocky outcrop. This shrine is dedicated to both Lord Shiva and Lord Vishnu. The temple has interconnected cisterns through which the sea can be let in to transform the temple into a water shrine. But, in recent times, a stone wall as been added to protect the shrine from the rising seas and further erosion. 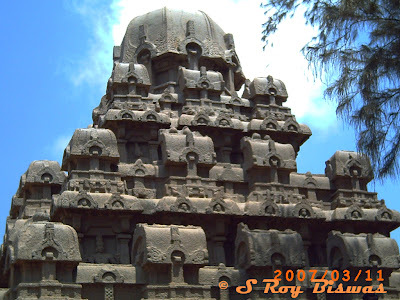 One of the prominent and still standing structures of the ancient times. Nice Blog with beautiful pictures. 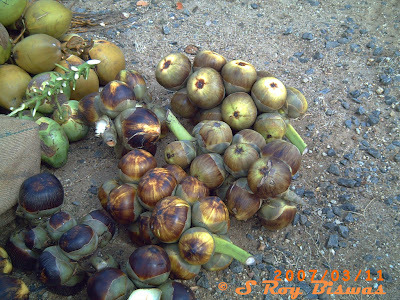 and Nungu awesome.. my favorite fruit of all time. Thanks for sharing the post. very informative.